We’ve put together a retreat that is both relaxing and invigorating. Visitors are invited to arrive hungry. Your journey begins with a bang. You arrive in Kuala Lumpur, the capital of Malaysia where you will feast on a smorgasbord of wonderfully prepared local food. Malaysian cuisine is a bewitching, colourful blend of herbs, spices and cultures; variety and tantalizing in taste. From here, you’ll be whisked off past rural sceneries to Penang for more feasting and finally to the breezy Langkawi island. Whether city-style indulgences or moonlight barbeques, it’s a guaranteed adventure for all the senses. Up north, the “Laksa” is a bowl of noodles with a flavourful broth. 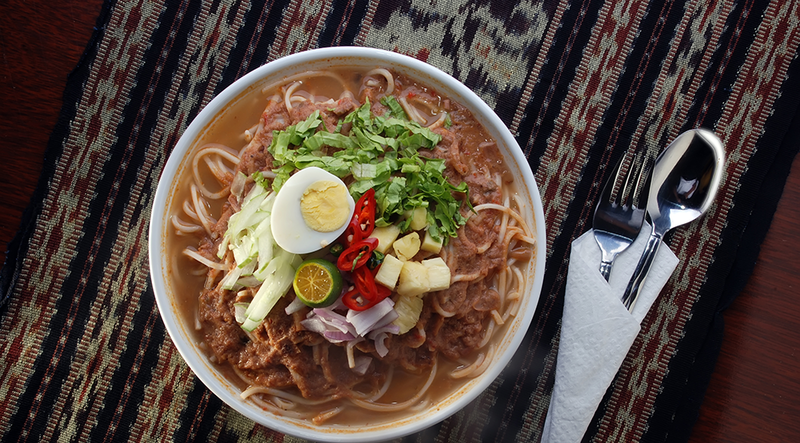 There are many renditions across Malaysia but the famous Penang Asam Laksa is a must-try for any tourist. ASAM LAKSA | There are many renditions of this dish in Malaysia itself. Penang, the land of delicious hawker food is a foodie heaven. A few dishes worth mentioning are Char Kuey Teow, Asam Laksa, Curry Mee, Cendol, and Hokkien Mee. Gurney Drive is laden with an array of tantalizing local street food with a beautiful view of the sea. Or go down south to Malacca, one of the two UNESCO historical cities, rich with Peranakan and Portuguese cuisine. Just follow your nose and the long queues to find the best eateries in town. If you’re tired of walking, hop on a colourful trishaw and experience the town on wheels.